So says Terry Malloy, the longshoreman who testifies against his union in “On the Waterfront.” The line, said by Marlon Brando, resonates all through the picture because the story is about conscience--and so is the story behind the story. This was the film made in 1954 by Elia Kazan after he agreed to testify before the House Un-American Activities Committee, named former associates who were involved with the Communist Party and became a pariah in left-wing circles. In that statement you can feel the passion that was ignited by the HUAC hearings and the defiance of those who named names, or refused to. For some viewers, the buried agenda of “On the Waterfront” tarnishes the picture; the critic Jonathan Rosenbaum told me he could “never forgive” Kazan for using the film to justify himself. But directors make films for all sorts of hidden motives, some noble, some shameful, and at least Kazan was open about his own. And he made a powerful and influential movie, one that continued Brando's immeasurable influence on the general change of tone in American movie acting in the 1950s. “If there is a better performance by a man in the history of film in America, I don't know what it is,” Kazan writes in his book. If you changed “better” to “more influential,” there would be one other performance you could suggest, and that would be Brando's work in Kazan's “A Streetcar Named Desire” (1951). In those early films, Brando cut through decades of screen mannerisms and provided a fresh, alert, quirky acting style that was not realism so much as a kind of heightened riff on reality. He became famous for his choices of physical gestures during crucial scenes (and as late as “The Godfather,” he was still finding them--the cat in his lap, the spray gun in the tomato patch). In “On the Waterfront,” there's a moment when Terry goes for a walk in the park with Edie (Eva Marie Saint), the sister of a man who has been thrown off a roof for talking to crime investigators. She drops a glove. He picks it up, and instead of handing it back, he pulls it on over his own workers' hands. A small piece of business on the edge of the shot, but it provides texture. The film was based on the true story of a longshoreman who tried to overthrow a corrupt union. In life, he failed; in the film, he succeeds, and today the ending of “On the Waterfront” feels too stagy and upbeat. The film was shot on location in Hoboken, N.J., on and near the docks, with real longshoremen playing themselves as extras (sometimes they're moved around in groups that look artificially blocked). Brando plays a young ex-prizefighter, now a longshoreman given easy jobs because Charley is the right-hand man of the corrupt boss, Johnny Friendly (Lee J. Cobb). After he unwittingly allows himself to be used to set up the death of Edie's brother, he starts to question the basic assumptions of his life--including his loyalty to Charley and Johnny, who after all ordered him to take a dive in his big fight in Madison Square Garden. The other major character is a priest (Karl Malden), who tries to encourage longshoremen to testify against corruption. After one rebel is deliberately crushed in the hold of a ship, the priest makes a speech over his body (“if you don't think Christ is down here on the waterfront, you got another think coming”). It would have been the high point of another kind of film, but against Brando's more sinuous acting, it feels like a set piece. Eva Marie Saint makes a perfect foil for Brando, and the two actors have a famous scene in a bar where he reveals, almost indirectly, that he likes her, and she turns the conversation from romance to conscience. At one point Kazan and his cameraman, Boris Kaufman, frame her pale face and hair in the upper-right-hand corner of the screen, with Brando in lower center, as if a guardian angel is hovering above him. The best scenes are the most direct ones. 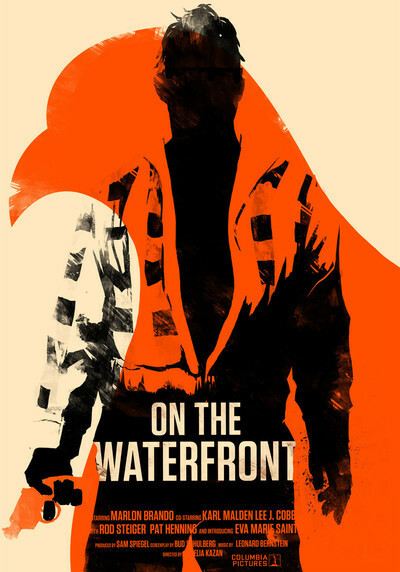 Consider the way Brando refuses to cooperate with investigators who seek him out on the docks, early in the film. And the way he walks around on the rooftop where he keeps his beloved pigeons--lithe and catlike. Steiger is invaluable to the film, and in the famous taxi conversation, he brings a gentleness to match Brando's: The two brothers are in mourning for the lost love between them. Schulberg's screenplay straddles two styles--the emerging realism and the stylized gangster picture. To the latter tradition belong lines like “He could sing, but he couldn't fly,” when the squealer is thrown off the roof. To the former: “You know how the union works? You go to a meeting, you make a motion, the lights go out, then you go out.” Brando's “contender” speech is so famous it's hard to see anew, but watch the film again and you feel the reality of the sadness between the two men, and the simple words that express it. “On the Waterfront” was nominated for 11 Oscars and won eight. Ironically, the other three nominations were all for best supporting actor, where Cobb, Malden and Steiger split the vote. Today the story no longer seems as fresh; both the fight against corruption and the romance fall well within ancient movie conventions. But the acting and the best dialogue passages have an impact that has not dimmed; it is still possible to feel the power of the film and of Brando and Kazan, who changed American movie acting forever. 60 Minutes on: "The Hate U Give"
A Living Legend: Tatsuya Nakadai on "Sword of Doom"